Louisiana's Cajun Bayou culture stems from its varied heritage, including French, Spanish, English and German speaking families who settled its banks in the early 1700's. In less than 200 years, their descendants, joined by Acadians expelled from Nova Scotia, merged those cultures, customs and heritages as well as those of the into a society known the world over as "Cajun Country." The original inhabitants of the land were the Chitamacha tribe of Native Americans who still live on ancestral lands in the area today. It seems that good food was inherent in the area; "Chitimacha" means; “those having cooking vessels”). The parish is approximately 100 miles long and 15 miles wide at its widest area. Lafourche Parish has a total area of 865,920 acres of which 730,048 acres are land and 135,872 acres are lakes, bays and streams. Lying entirely within the Mississippi River Delta, the main physiographic features of the parish are the natural levees, marshes and sandy ridges. 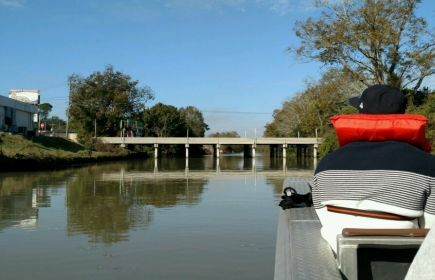 Elevation ranges from about 15 feet above sea level along Bayou Lafourche to sea level and below near the Gulf of Mexico. Most of the soils on the natural levees are cultivated for sugar cane, and the soils in the marshes and other low-lying areas remain in native vegetation and are used for wildlife habitat and recreation. Lafourche Parish has three incorporated municipalities: Thibodaux (parish seat), Lockport, and Golden Meadow. The population of Lafourche Parish was 92,179, according to the 2010 census estimate. The name Lafourche, which is French for “the fork” aptly describes the area geographically. From the green fields of sugar cane in the north to the seacoast dotted with offshore platforms, the parish hosts a diversity of industries. Shrimp trawlers roll through the wave troughs, passing charter boats of fishermen and crewboats filled with oil workers, contrasting the old with the new. Because of its location, the Bayou Lafourche area has long, warm summers cooled by the Gulf breezes. Average summer temperatures are between 81 and 90 degrees. Winters are warm and only occasionally interrupted by cool air from the north. Average temperature during the winter is between 44 and 54 degrees. Rains occur throughout the year and precipitation is adequate for all crops.